Several alert and knowledgeable readers wrote in to comment that I had better watch out--all that winding and re-winding would impart a twist to my yarn, a twist I might live to regret. "Perhaps you should not wind and re-wind quite so freely" was the consensus. My education has included lab classes to learn firsthand the value of experimentation, yes sir, so I determined to get to the bottom of this scientifically. Here's my lab report. Does winding on a ball winder cause yarn to twist? It is possible to avoid imparting twist when winding and re-winding yarn on a ball winder. Step 2: The 4-yard long tape was wound onto the umbrella swift, laying smoothly. Step 3: the tape measure-snake was wound from the umbrella swift onto the ball winder. If the tape measure was smooth on the umbrella swift, it wound smoothly onto the ball winder. 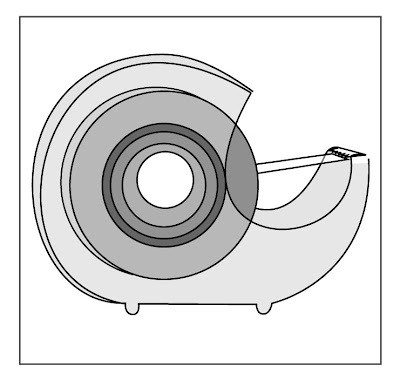 If the ball winder handle was turned one way, the inch side faced outward, if the handle was turned the other way, the cm side faced outward, but in neither case was any twist imparted to the "cake" of tape-measure on the ball winder. NO TWIST. I'll say it again: If the yarn lay smooth on the umbrella swift, it didn't matter which way the handle was turned. There was NO TWIST in the flat tape. However, now it gets interesting. As soon as the tape-measure was attempted to be CENTER-PULLED out of the cake into which the ball-winder had deposited it, there appeared the TWIST the commenters prophesized. In other words, there was twist, yes, the alert commenters were 100% correct. However, lucky for me and my ball-winding ways, it wasn't the winding which caused the twist--it was center-pulling the resulting cake which twisted the tape. "it is center pulling ... which twisted the tape." But now it gets even MORE interesting. Pulling from the outside of the tape-measure cake also produced a twist UNLESS I took the trouble to turn the cake as I tried to "knit" the tape. 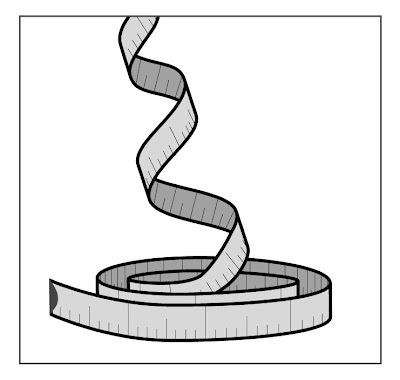 Fastening the tape-measure (more scotch tape, yes) on a lazy susan (stolen from the kitchen) then pulling the tape-end resulted the lazy susan spinning around, and the tape coming off with a smooth un-spooling and NO TWIST. There are two important consequences: first, when using the ball-winder to wind FROM a skein, the yarn being re-wound must not be center-pulled from the skein to the ball-winder, for that would twist the yarn. (This is a corollary of the fact that center-pulling from a cake twists yarn: the same would happen from a skein!) Instead, the yarn skein being re-wound must be unwound from the skein's outside. IF you center-pull yarn from skeins or cakes, you will get twist. IF, however, you always unwind cakes or skeins from the outside, AND smoothly unspool caked yarn via a lazy susan or core-and-spindle, then winding and rewinding will NOT TWIST THE YARN. In this manner, it is possible to make full use of a ball-winder as shown in the previous post, and all without imparting twist. Well, that's the end of the lab report, and all's well that ends well. Although now I come to think of it, "well" is a relative term. I still have to explain why the lazy-susan has migrated from the kitchen to sit by the ball-winder, and why the paper towel dispenser from the basement is upstairs wearing a yarn cake on a toilet-paper core. However, at least the scotch tape is back where it belongs, so that's a start, right? A big thank you to the commenters on the previous post: Honnay, who first flagged the problem and Mercuria and Jennigma who explained further. (Talk about scary--they're all three engineers!) Many thanks also to GJabori who suggested the lazy susan, and June, who explained further, as well as suggesting the toilet paper core and spindle. Thanks for reading, thanks for commenting and good knitting! You've been reading TECHknitting blog on: avoiding yarn twist when using a ball winder. Avoiding yarn twist--why does it matter?